Newly signed law is one of several across the U.S. to curtail municipal governments’ power. 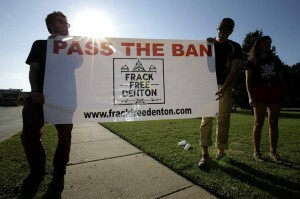 Last year, a city in North Texas banned fracking. State lawmakers want to make sure that never happens again. On Monday, Republican Gov. Greg Abbott signed a law that prohibits bans of hydraulic fracturing altogether and makes it much harder for municipal and county governments to control where oil and gas wells can be drilled. Similar efforts are cropping up in states including New Mexico, Ohio, Colorado and Oklahoma, where both chambers of the legislature have passed a bill that limits local governments to “reasonable” restrictions on oil and gas activities. This is all part of a broader legislative and judicial effort, backed by the oil industry, to limit local governments’ ability to regulate drilling. Backers say that both the Oklahoma and Texas bills were proposed in response to a voter-approved ban on fracking in Denton, Texas, in November. One of the authors of the Texas bill said his motivation was to protect an economically important industry. “Oil is a huge job driver for the state of Texas,” said state Sen. Troy Fraser, a Republican from the central part of the state. The new law eliminates a “patchwork of local ordinances creating more and more regulation, some of which is intentionally onerous and intended to stop or limit oil and gas development,” said Ed Longanecker, president of the Texas Independent Producers and Royalty Owners Association. The law has angered officials in Denton, about 50 miles northwest of Dallas, where residents approved the first ban in the state. Officials there said they supported it only after failed efforts to resolve quality-of-life problems including a well explosion and noisy drilling near homes and schools.